In recent years, however there has been a drastic increase in the number of patients returning to the hospital within 30-days of being discharged. Healthcare providers, from both the acute and post-acute care fields, have sought new strategies and techniques to help patients avoid difficult, and expensive, hospital visits. Today, with developments in technology and the evolution of telemedicine, patients can take an active interest in their care. Pioneering in-home electronic health monitoring in the state, Visiting Nurse Association of Ohio’s TeleHealth program offers chronic disease management for patients striving to remain healthy and out of the hospital. The innovative technology is impacting healthcare systems around the country. Continuously monitoring patients to keep them healthy, and out of the hospital, has led to overall cost reductions and healthier communities. 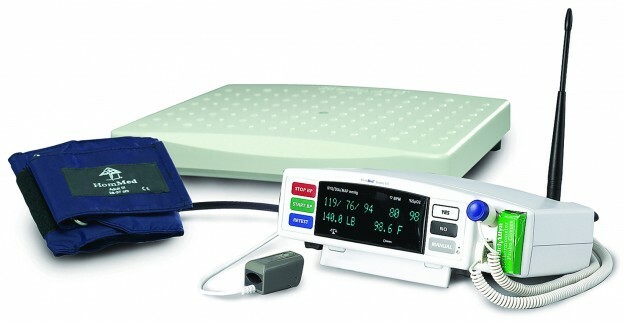 When a VNA of Ohio patient opts for TeleHealth, our daily in-home management program, they are provided a monitoring unit with a variety of medical devices, including a weight scale and a blood pressure cuff. The monitor, connected to the patient’s phone, relays the vital information to a VNA of Ohio nurse in real time. Each monitor is programmed to the needs of the patient and tracks vital signs including heart rate, blood pressure, weight, temperature, and oxygen levels. If the patient’s vitals are irregular, a VNA of Ohio nurse contacts the patient to discuss changes in order to avoid further complications. If abnormalities persist, the patient’s physician is contacted to discuss next steps. With programs such as TeleHealth, patients have the necessary education and resources to monitor their health and prevent frequent, avoidable hospitalizations. Besides the benefits of having patients take an active role in managing in their health, chronic disease management programs have shaped how patients live independently in their home. For VNA of Ohio patients, there has been a 19.85% reduction in emergency room visits; a 29.78% reduction of inpatient care; and a 4.25% reduction in hospital readmissions within 30-days of discharge. “Not only does our TeleHealth program reduce emergency room visits and hospital readmissions, it also improves functional status for our patients,” sayings VNA of Ohio president and chief executive officer, Claire M. Zangerle. The outcomes speak for themselves.